Every day people and business owners remain very confused about what is actually going on in the economy. They can feel that nothing is actually getting better, and in most cases continues to get worse, yet they turn on the news to read about new highs in the DOW and try to rationalize in their minds what is happening. This global GDP contraction has pushed global trade close to moving back into negative territory as it did in late 2008. I came across some interesting comments this week published by the ECRI group discussing how the economy looked just days before the Lehman Brothers collapse. It shows how when you drive down the road looking in the rear view mirror, as people in the financial markets are once again doing today, it can prove very dangerous based on what could be coming ahead. 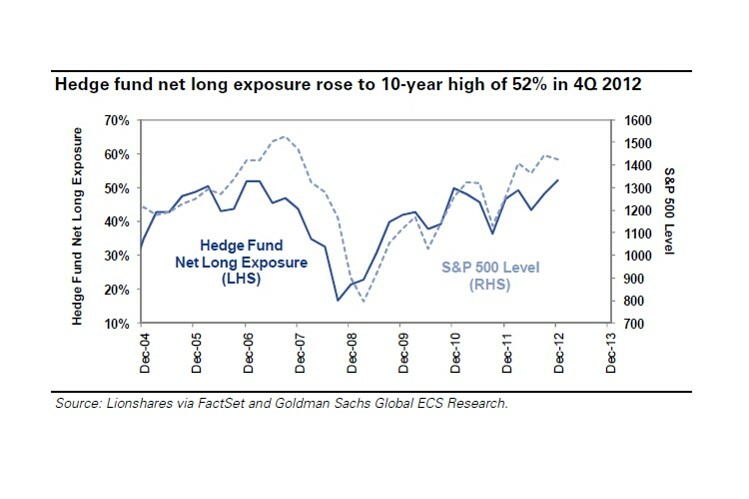 "Think back to 2008, a couple of days before the Lehman failure. 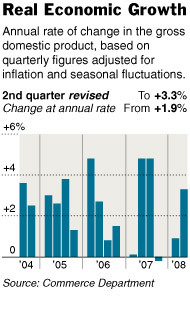 Looking at the data in hand, you would see GDP growth at about 1% in Q1 and 3% in Q2. More specifically, Q2 GDP growth had just been revised up on August 28 from 1.9% to 3.3%, sparking a 212-point Dow rally that day." The New York Times article from that day read: "Economic Growth Revised Higher." Here was the chart of GDP growth investors were looking at on August 28, 2008, just moments before stocks were ready to enter free fall. Today we are looking at the fourth quarter 2012 GDP numbers listed above showing the global contraction already in place yet investors are more optimistic than almost any other time in history. Things do not feel like late 2008, they feel like late 2007. At that time no one could pin point any kind of danger ahead. It was widely regarded that any trouble could be immediately solved by the Federal Reserve lowering interest rates. Today that same attitude is in place only investors believe all problems can be solved with larger doses of QE. 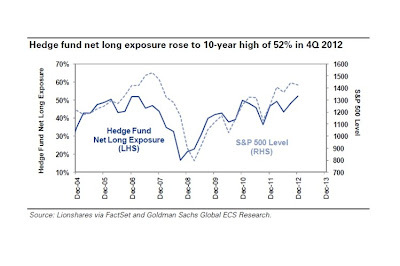 Hedge funds today are now more bullish than they were in late 2007. 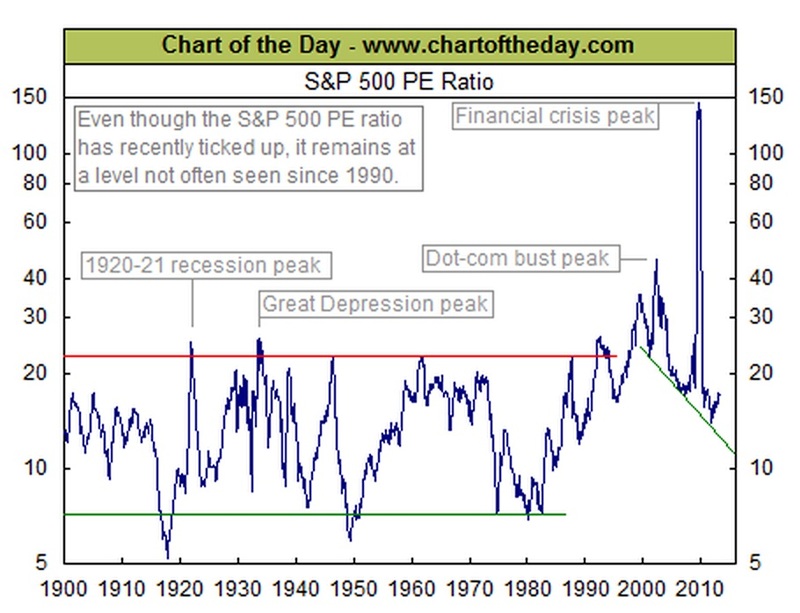 The following chart provides a historical review of P/E ratios on the S&P 500 going back to 1900. It shows that historically the 22 range (red line) was the peak point in stock market cycles while 7 (green line) marked the low end. Today we are just under 20. I like to buy assets when they are undervalued and hated. 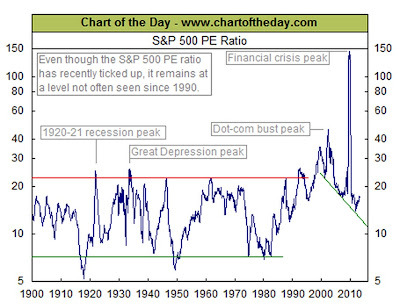 Stocks today are overvalued and loved. Can they become more overvalued and more loved? Of course. History shows that irrationality in the markets tend to go on much longer than rational participants can imagine while they watch in real time. The madness of the crowd has once again set in. While I wait for opportunities today, I raise cash in a fund that earns me a 0.1% return. This is considered insane due the "wasted return" I am missing on stock dividends and long term bonds. I believe that when gravity sets in, a 0.1% return will look very attractive.